Black Whispers are a project from Costa Rica, formed in 2013 by José ‘S.S’ Fonseca, nowadays acting as JF or J.F. After a very limited split with Noldor, José recorded + released his debut under the Black Whispers moniker (Negative Ways Of Life) in early 2014 (Depressive Illusions Productions) with assistance of session musician Diego ‘Lwl’ Sanchez. In 2015 this guy joined forces with two musicians that I do like a lot for their mutual projects, and it made me quite aroused: Mexican guy Nergot and Italian beauty Kjiel, both active in, for example, Sacrimoon or Lifeless (for both these projects, I recently wrote and updated a review for their latest releases: Reflections Of My Suicide Melancholy was published on April 11th 2016, and Inner Shouts From A Sad Soul on March 24th). And seen the happy presence of those acts (and the others both these musicians are, separately, involved with), this Black Whispers will surely follow a same-minded trend; or am I mistaken? You’ll find out soon. Together with session drummer HK (a colleague of Kjiel in Eyelessight, by the way), the trio did record a second full length album (there was an EP as well in January 2015), including mixing / mastering assistance of Eyelessight / Deep-pression’s Ky (who did some mixing assistance for Sacrimoon and Lifeless before, by the way). The material was recorded over a period of almost one year, as from July 2014 until June 2015, and the result brings thirty-six minutes of mostly unhappy ear candy. What else did you expect? 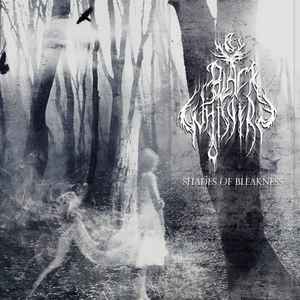 No, seriously, Black Whispers perform the bleakest, most melancholic kind of Black Metal, totally freaked out with emotions of pure negativity, melancholy, depression and self-mutilation. Actually, it’s beautiful to experience. Sonic-wise, the album is based on quite low melodies, with quite some diversity in tempo and structure. The main parts are built around melancholic guitar lines, with a minimal rhythm section and very painful screams. But there are quite some semi-acoustic intermezzi, which might not necessarily express originality, but they do not need to. In general, the modest bombastic orchestrations sort of uncover unhappy feelings, brought the aural way in a most beautiful package! The use of synths and acoustic guitars is pretty important, carrying quite a lot of this album’s conceptual approach. That attitude gets quite clear within the performance of the last song, being a cover track of Swedish Life Neglected (a short-lived outfit by Henrik ‘Nachtzeit’ Sunding, you know, the guy behind e.g. Lustre).